Students from Notre Dame built raised beds and taught lessons on seed starting March 13 at St Mark School in Richmond. The lessons are aligned with national science standards and core curriculum. 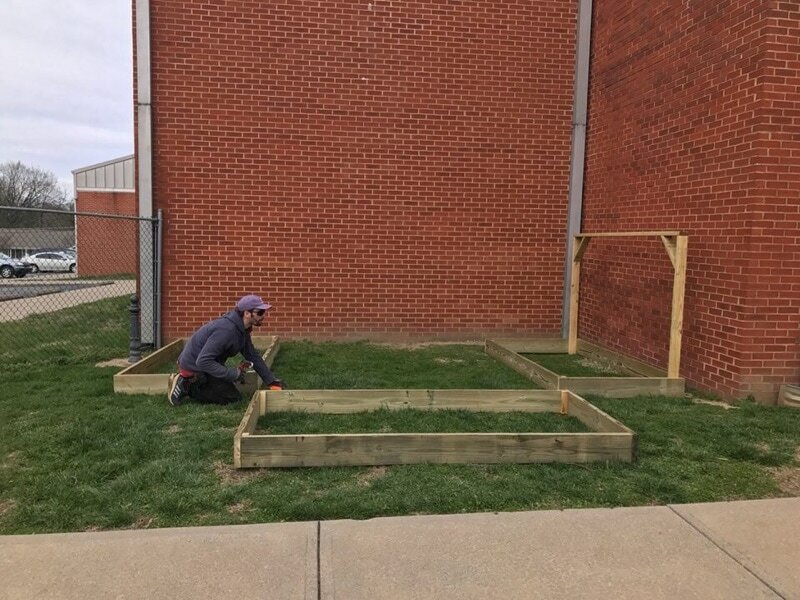 Hal Van Etten facilitated and supervised the construction of the raised beds. 6 Service Learning Students taught the Planting a Garden Lesson to grades pre K- 5. A fire has destroyed our Solar House and 20 acres of forest. The solar house has been a key demonstration of appropriate technology and sustainable development imperative to our educational programs. Our Wilderness Site hosts several demonstration buildings and the Mary E. Fritsch Nature Center on over 200 acres of forested land adjacent to the Daniel Boone National Forest. Unfortunately, our liability coverage doesn’t cover the loss of our solar house, or the cleanup to mitigate damage to the surrounding forest. The Wilderness Site is the only outdoor educational facility with a nature center, walking trails, and educational programming with easy access from Interstate 75 between Lexington, KY, and the Tennessee border. Located 60 miles south of Lexington, it is one of the only two options for outdoor education in a ten county region. Mark Spencer has been living in the Solar House for almost 20 years. He lost everything. If you want to help please click on the Donate button. If you have clothes or supplies or services please contact us at aspi@a-spi.org. For $1.00 a day, you can pay the rent and utilities for a college intern! For $20.00 a month, you can provide a scholarship for that student! ​For$.50/ day you can pay for an elementary school to have a STEM-based informal discovery program for 4 weeks! $.50/ day will support a workshop on low-cost solar or sustainable building! How will you help us make a difference?